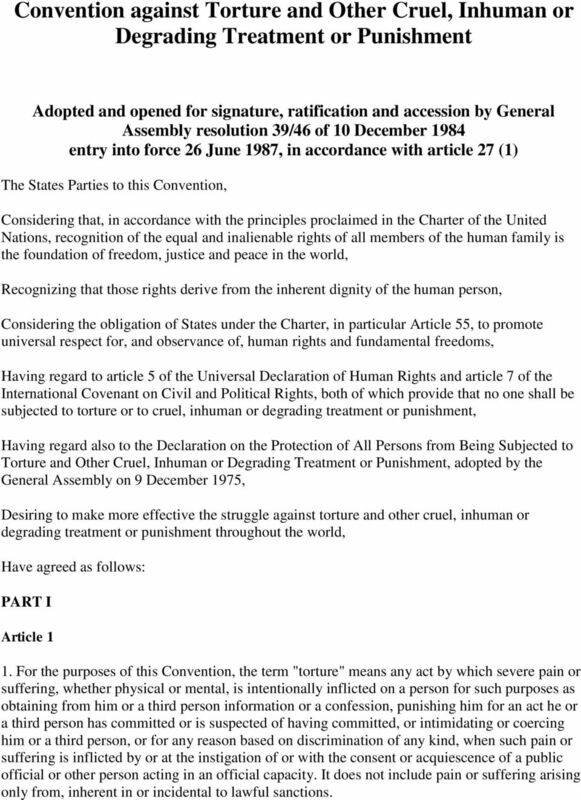 Download "Convention against Torture and Other Cruel, Inhuman or Degrading Treatment or Punishment"
1 Convention against Torture and Other Cruel, Inhuman or Degrading Treatment or Punishment Adopted and opened for signature, ratification and accession by General Assembly resolution 39/46 of 10 December 1984 entry into force 26 June 1987, in accordance with article 27 (1) The States Parties to this Convention, Considering that, in accordance with the principles proclaimed in the Charter of the United Nations, recognition of the equal and inalienable rights of all members of the human family is the foundation of freedom, justice and peace in the world, Recognizing that those rights derive from the inherent dignity of the human person, Considering the obligation of States under the Charter, in particular Article 55, to promote universal respect for, and observance of, human rights and fundamental freedoms, Having regard to article 5 of the Universal Declaration of Human Rights and article 7 of the International Covenant on Civil and Political Rights, both of which provide that no one shall be subjected to torture or to cruel, inhuman or degrading treatment or punishment, Having regard also to the Declaration on the Protection of All Persons from Being Subjected to Torture and Other Cruel, Inhuman or Degrading Treatment or Punishment, adopted by the General Assembly on 9 December 1975, Desiring to make more effective the struggle against torture and other cruel, inhuman or degrading treatment or punishment throughout the world, Have agreed as follows: PART I Article 1 1. 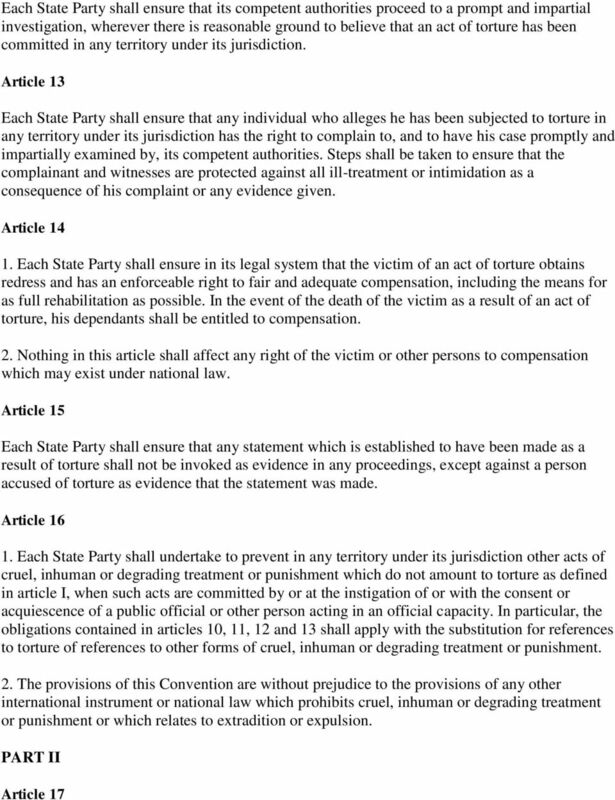 For the purposes of this Convention, the term "torture" means any act by which severe pain or suffering, whether physical or mental, is intentionally inflicted on a person for such purposes as obtaining from him or a third person information or a confession, punishing him for an act he or a third person has committed or is suspected of having committed, or intimidating or coercing him or a third person, or for any reason based on discrimination of any kind, when such pain or suffering is inflicted by or at the instigation of or with the consent or acquiescence of a public official or other person acting in an official capacity. It does not include pain or suffering arising only from, inherent in or incidental to lawful sanctions. 6 1. There shall be established a Committee against Torture (hereinafter referred to as the Committee) which shall carry out the functions hereinafter provided. The Committee shall consist of ten experts of high moral standing and recognized competence in the field of human rights, who shall serve in their personal capacity. The experts shall be elected by the States Parties, consideration being given to equitable geographical distribution and to the usefulness of the participation of some persons having legal experience. 2. 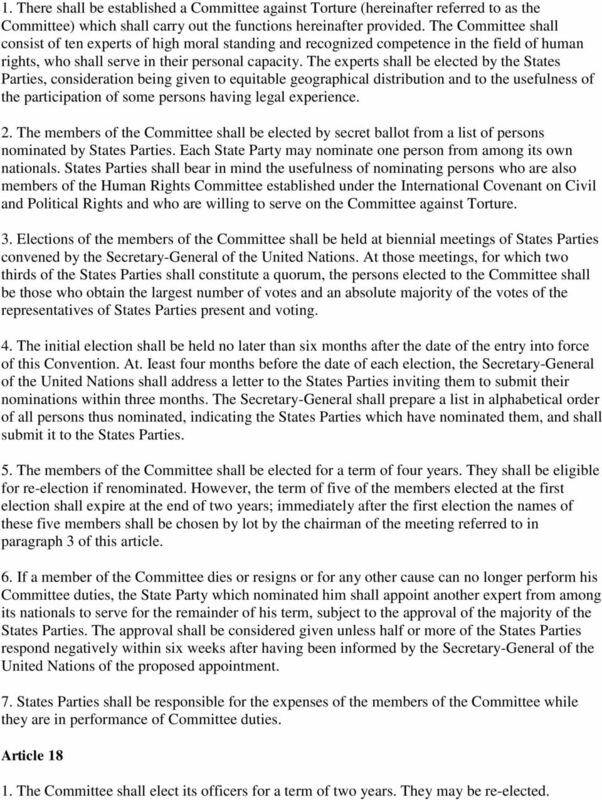 The members of the Committee shall be elected by secret ballot from a list of persons nominated by States Parties. Each State Party may nominate one person from among its own nationals. 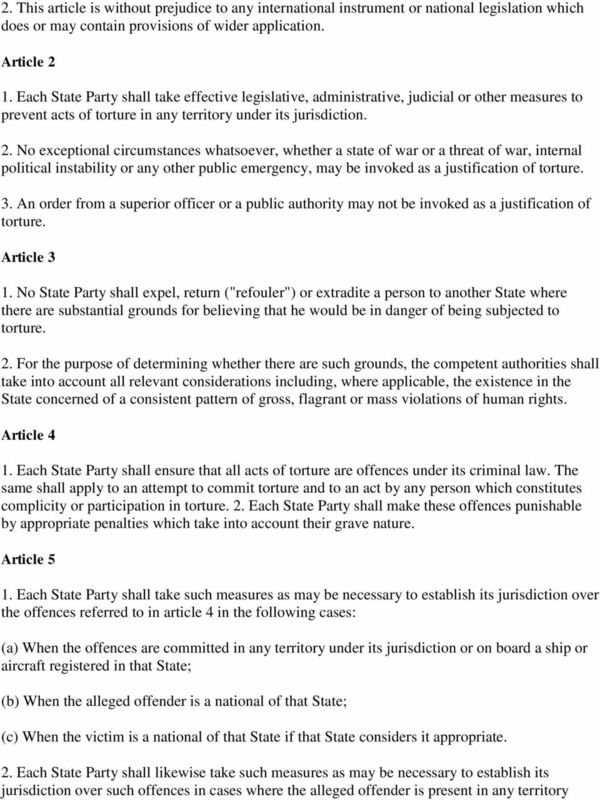 States Parties shall bear in mind the usefulness of nominating persons who are also members of the Human Rights Committee established under the International Covenant on Civil and Political Rights and who are willing to serve on the Committee against Torture. 3. Elections of the members of the Committee shall be held at biennial meetings of States Parties convened by the Secretary-General of the United Nations. At those meetings, for which two thirds of the States Parties shall constitute a quorum, the persons elected to the Committee shall be those who obtain the largest number of votes and an absolute majority of the votes of the representatives of States Parties present and voting. 4. The initial election shall be held no later than six months after the date of the entry into force of this Convention. At. Ieast four months before the date of each election, the Secretary-General of the United Nations shall address a letter to the States Parties inviting them to submit their nominations within three months. The Secretary-General shall prepare a list in alphabetical order of all persons thus nominated, indicating the States Parties which have nominated them, and shall submit it to the States Parties. 5. The members of the Committee shall be elected for a term of four years. They shall be eligible for re-election if renominated. However, the term of five of the members elected at the first election shall expire at the end of two years; immediately after the first election the names of these five members shall be chosen by lot by the chairman of the meeting referred to in paragraph 3 of this article. 6. If a member of the Committee dies or resigns or for any other cause can no longer perform his Committee duties, the State Party which nominated him shall appoint another expert from among its nationals to serve for the remainder of his term, subject to the approval of the majority of the States Parties. The approval shall be considered given unless half or more of the States Parties respond negatively within six weeks after having been informed by the Secretary-General of the United Nations of the proposed appointment. 7. States Parties shall be responsible for the expenses of the members of the Committee while they are in performance of Committee duties. Article The Committee shall elect its officers for a term of two years. They may be re-elected. 7 2. The Committee shall establish its own rules of procedure, but these rules shall provide, inter alia, that: (a) Six members shall constitute a quorum; (b) Decisions of the Committee shall be made by a majority vote of the members present. 3. The Secretary-General of the United Nations shall provide the necessary staff and facilities for the effective performance of the functions of the Committee under this Convention. 4. The Secretary-General of the United Nations shall convene the initial meeting of the Committee. After its initial meeting, the Committee shall meet at such times as shall be provided in its rules of procedure. 5. 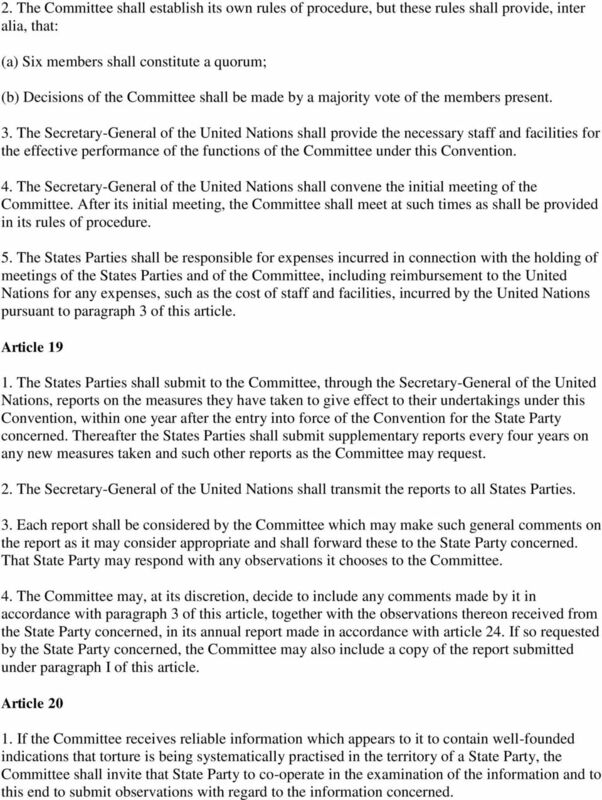 The States Parties shall be responsible for expenses incurred in connection with the holding of meetings of the States Parties and of the Committee, including reimbursement to the United Nations for any expenses, such as the cost of staff and facilities, incurred by the United Nations pursuant to paragraph 3 of this article. 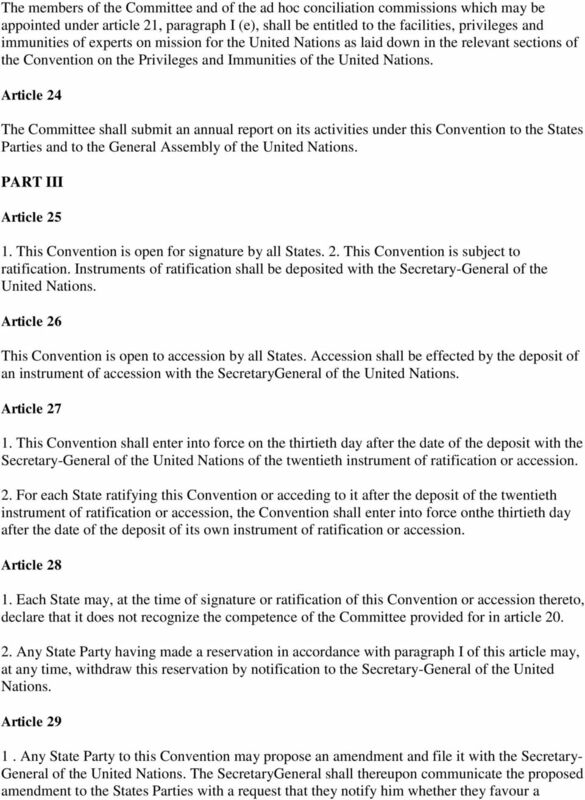 Article The States Parties shall submit to the Committee, through the Secretary-General of the United Nations, reports on the measures they have taken to give effect to their undertakings under this Convention, within one year after the entry into force of the Convention for the State Party concerned. Thereafter the States Parties shall submit supplementary reports every four years on any new measures taken and such other reports as the Committee may request. 2. 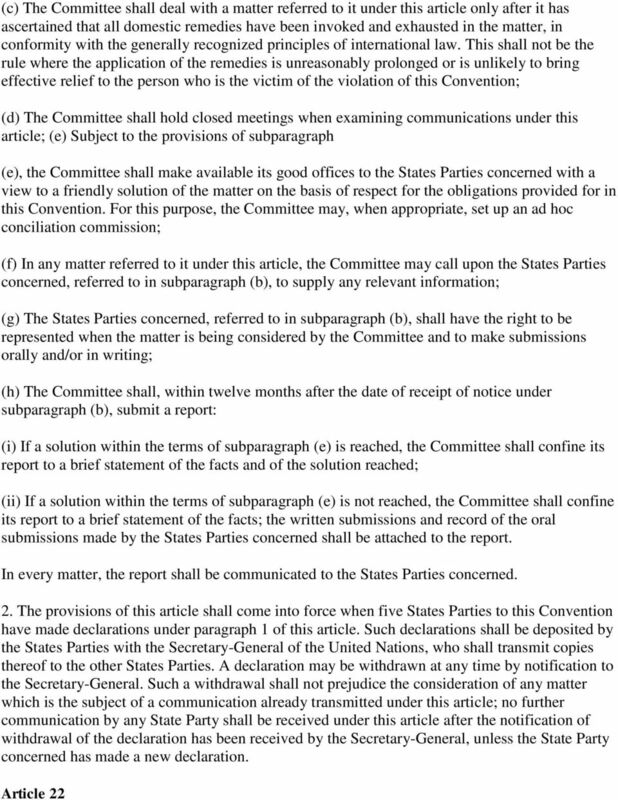 The Secretary-General of the United Nations shall transmit the reports to all States Parties. 3. Each report shall be considered by the Committee which may make such general comments on the report as it may consider appropriate and shall forward these to the State Party concerned. That State Party may respond with any observations it chooses to the Committee. 4. The Committee may, at its discretion, decide to include any comments made by it in accordance with paragraph 3 of this article, together with the observations thereon received from the State Party concerned, in its annual report made in accordance with article 24. If so requested by the State Party concerned, the Committee may also include a copy of the report submitted under paragraph I of this article. 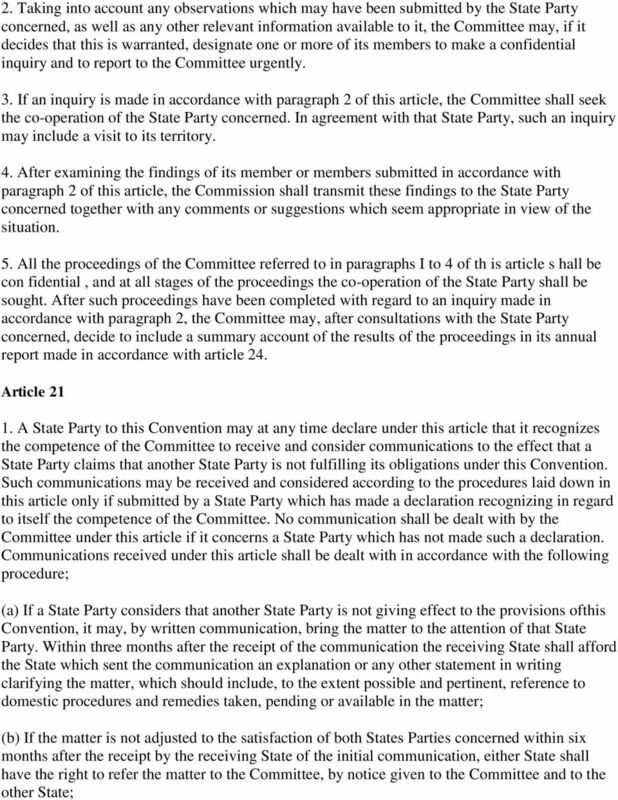 Article If the Committee receives reliable information which appears to it to contain well-founded indications that torture is being systematically practised in the territory of a State Party, the Committee shall invite that State Party to co-operate in the examination of the information and to this end to submit observations with regard to the information concerned. 12 conference of States Parties for the purpose of considering an d voting upon the proposal. In the event that within four months from the date of such communication at least one third of the States Parties favours such a conference, the SecretaryGeneral shall convene the conference under the auspices of the United Nations. Any amendment adopted by a majority of the States Parties present and voting at the conference shall be submitted by the Secretary-General to all the States Parties for acceptance. 2. 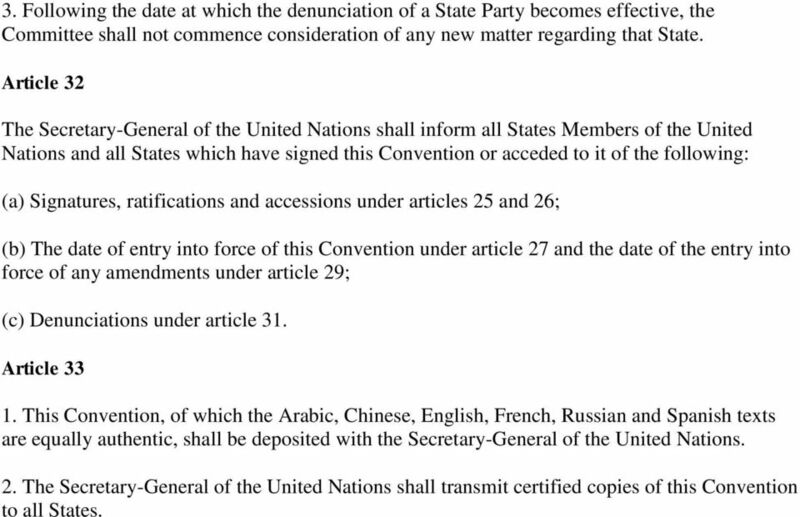 An amendment adopted in accordance with paragraph I of this article shall enter into force when two thirds of the States Parties to this Convention have notified the Secretary-General of the United Nations that they have accepted it in accordance with their respective constitutional processes. 3. When amendments enter into force, they shall be binding on those States Parties which have accepted them, other States Parties still being bound by the provisions of this Convention and any earlier amendments which they have accepted. 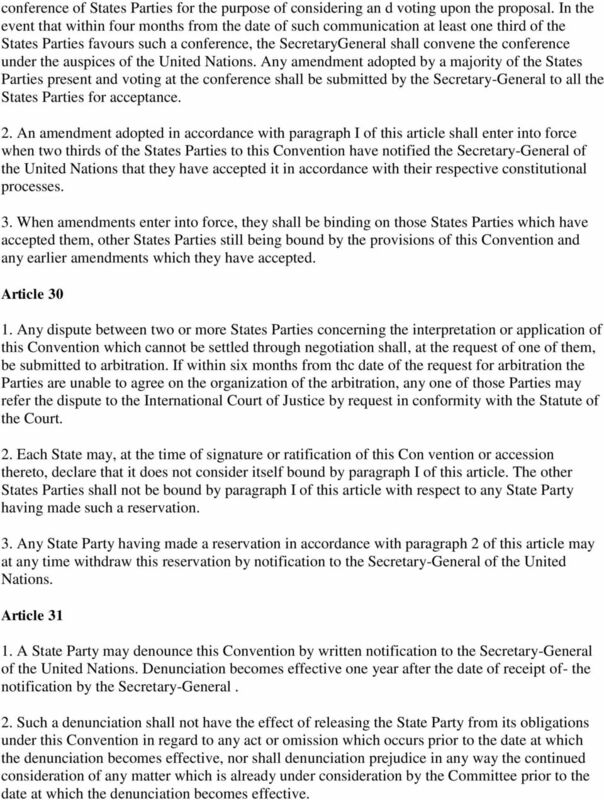 Article Any dispute between two or more States Parties concerning the interpretation or application of this Convention which cannot be settled through negotiation shall, at the request of one of them, be submitted to arbitration. 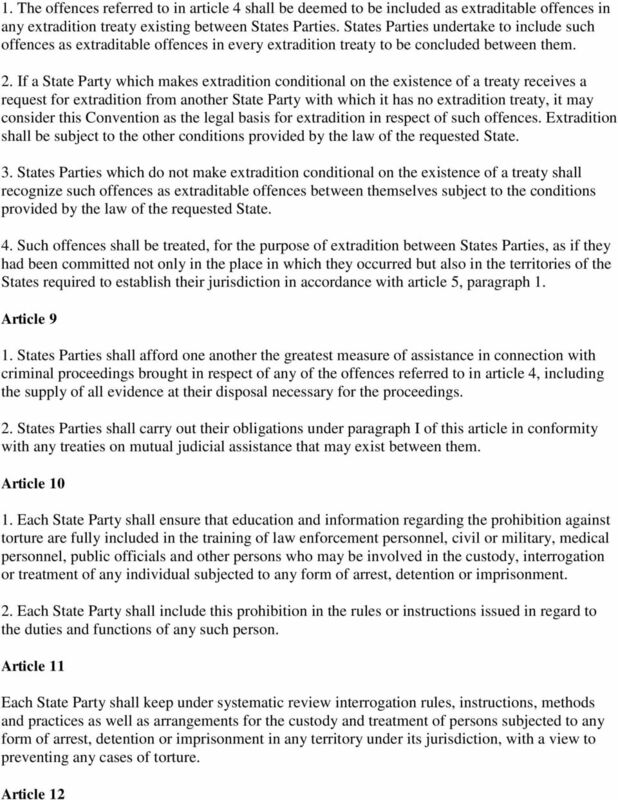 If within six months from thc date of the request for arbitration the Parties are unable to agree on the organization of the arbitration, any one of those Parties may refer the dispute to the International Court of Justice by request in conformity with the Statute of the Court. 2. 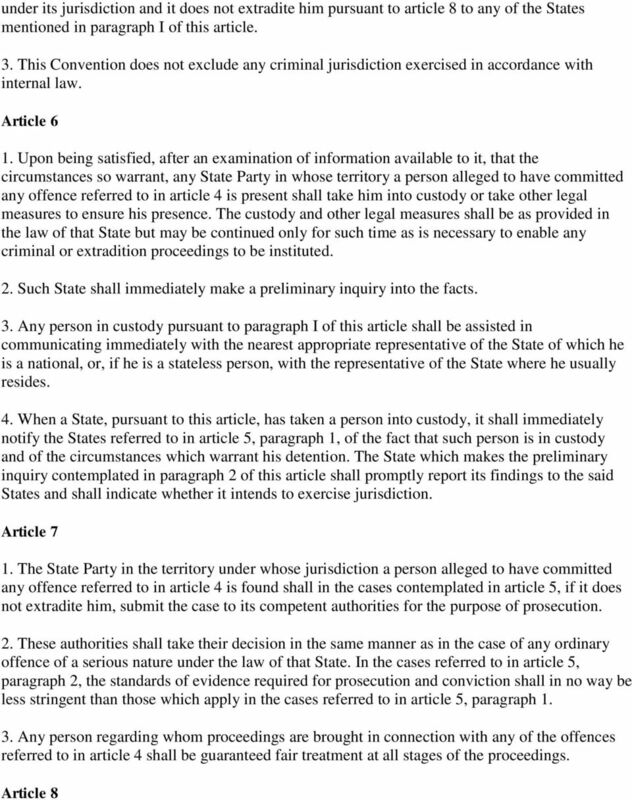 Each State may, at the time of signature or ratification of this Con vention or accession thereto, declare that it does not consider itself bound by paragraph I of this article. The other States Parties shall not be bound by paragraph I of this article with respect to any State Party having made such a reservation. 3. Any State Party having made a reservation in accordance with paragraph 2 of this article may at any time withdraw this reservation by notification to the Secretary-General of the United Nations. Article A State Party may denounce this Convention by written notification to the Secretary-General of the United Nations. Denunciation becomes effective one year after the date of receipt of- the notification by the Secretary-General. 2. Such a denunciation shall not have the effect of releasing the State Party from its obligations under this Convention in regard to any act or omission which occurs prior to the date at which the denunciation becomes effective, nor shall denunciation prejudice in any way the continued consideration of any matter which is already under consideration by the Committee prior to the date at which the denunciation becomes effective. 13 3. Following the date at which the denunciation of a State Party becomes effective, the Committee shall not commence consideration of any new matter regarding that State. Article 32 The Secretary-General of the United Nations shall inform all States Members of the United Nations and all States which have signed this Convention or acceded to it of the following: (a) Signatures, ratifications and accessions under articles 25 and 26; (b) The date of entry into force of this Convention under article 27 and the date of the entry into force of any amendments under article 29; (c) Denunciations under article 31. Article This Convention, of which the Arabic, Chinese, English, French, Russian and Spanish texts are equally authentic, shall be deposited with the Secretary-General of the United Nations. 2. 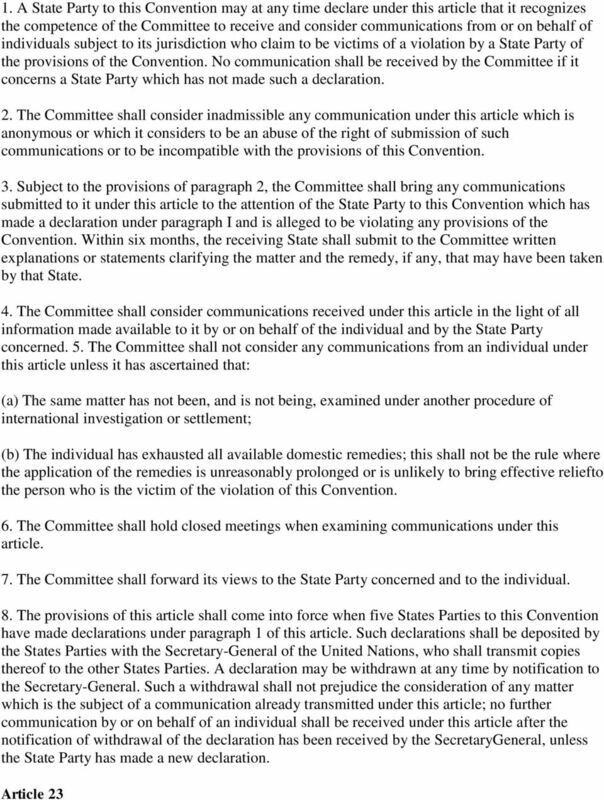 The Secretary-General of the United Nations shall transmit certified copies of this Convention to all States.